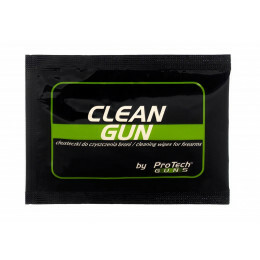 Our Clean Gun weapon cleaning wipes are specially designed for fast and convenient gun maintenance after short and regular usage at the shooting range. Thanks to anti-corrosion and lubricating solution, you can not only clean, but also maintain your weapon in top condition. Clean Gun weapon cleaning wipes are characterized with exceptional performance and provide ultimate lubrication protection for all wear parts and the bore. This great product is perfect for long-term storage, maintaining weapons in fire-ready condition!